Want to bring Bali's art and fantastic culture home? You can, by visiting the island's many outlets for shopping - from street vendors to traditional markets to gleaming malls. The small-town workshops in Central Bali and South Bali churn out plenty of inventory for Bali tourists with money to burn: art, houseware, jewelry, clothes, and knick-knacks, you'll find them all in South and Central Bali's boutiques, markets, and shopping centers. Even upscale Western brands get their day in the Balinese sun, with Western brands like DKNY and Armani jostling for space between local high-end brands like Uluwatu lace and Animale apparel. Due to Bali's centuries-long heritage as a land of royalty and high culture, a number of towns in the interior possess well-developed artisanal communities specializing in one or more crafts. Batubulan, for example, is renowned for its stone carving industry, while Sidemen is famous for its fine textiles. In central Bali, shoppers in the know go to Celuk for gold and silverware and visit Mas to purchase wood sculpture. You don't have to go too far out of your way to get your hands on fine Celuk-made earrings or a few yards of Sidemen cloth. Bali's full range of artsy wares can be purchased close to your hotel, at the many malls and shopping centers located in the island's high-traffic tourist areas, particularly the towns of Kuta and Ubud. Artisans from the Central Bali town of Singapadu carve topeng (masks) for cultural dancers and Balinese temples; these hand-crafted, goggle-eyed faces can be seen in performances all over Bali. These masks are generally commissioned for traditional purposes only, but many examples find their way to art markets and malls in South Bali and Ubud. For generations, the town of Celuk has excelled in the production of silver and gold jewelry. Tourism has breathed new life into the local craft, as visitors can now browse among a wide assortment of shops along the town's main road, all hawking rings, earrings, bracelets, brooches, and more, in both traditional and modern designs. You can go deeper into the village to meet the actual artisans, and possibly negotiate a lower price. Local jewelry brands like Prapenand Mario Silver sell their Celuk-made bling in Kuta, Ubud, and far abroad. In Denpasar, you can find plenty of gold and silver dealers along the intersection of Jalan Hasanuddin and Jalan Sulawesi. Bali's craftsmen have long had experience working in wood and stone - the ancient Balinese created plenty of statuary out of plentiful local raw material for use in their traditional ceremonies. Local stone sculpture (actually crafted out of sandstone) and wood carvings evoke traditional Hindu myths, but modern themes and styles are taking up more and more shelf space in the shops. Thanks partly to burgeoning demand from vacationing Australian homemakers, many Balinese artisans have turned to churning out tastefully-designed home items that add Asian flair to any kitchen. Visit Balinese department stores like Matahari and Centro Lifestyle for your fix, or buy them at wholesale prices from outlets like Geneva, ​Krisna Bali, and Biarritz. The textile market at Jalan Sulawesi in Bali's capital Denpasar sells both traditional and modern fabrics at wholesale prices. Batik, lace, rayon - you name it, it's here. The finished product (with accompanying high markups) can be purchased at any upscale mall in South Bali. 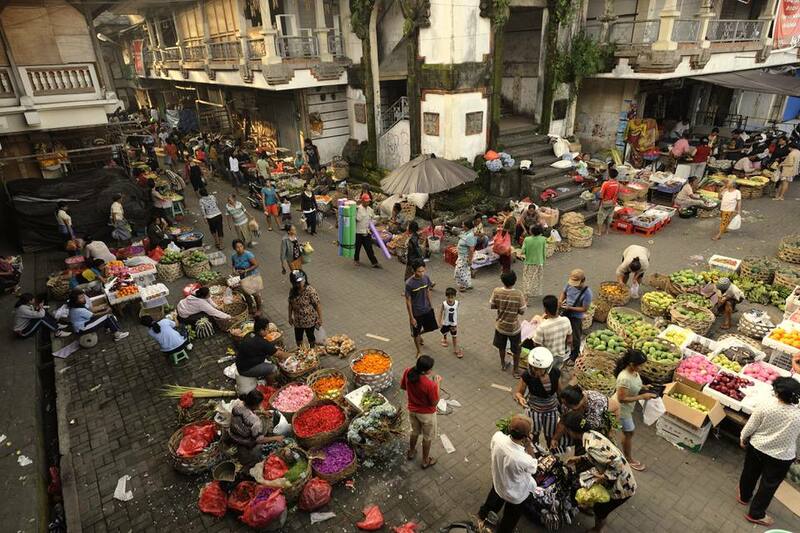 The majority of Bali's retail outlets can be found in South Bali (particularly Kuta, Legian and Denpasar) and Central Bali (particularly Ubud). The target market for either region is quite different, with some overlap in between. While in Centeral Bali, look for art and wellness products like essential oils, soaps, and incense. If you value low price over high quality, then you should stop by the Ubud Market and take a leisurely look around: its cramped corridors sell plenty of cheap artwork, hand-carved wooden souvenirs, and colorful sarongs and batiks. The streets radiating away from the town center - Jalan Raya Ubud and Jalan Monkey Forest - are brimming with boutiques selling upmarket soaps, jewelry, and preserves. Venture even further out to the crafts villages surrounding Ubud, and you can get your art fix at wholesale prices, if you know how to bargain well. Mas is a woodworking town; the aforementioned Celuk is gold and silver central; and Batubulan is the center for stonework. Do your homework. First, find out how much your objects of desire cost in Bali's fixed-price shops. Once you've done this, you can go to a Bali market and bargain with confidence. If the prices in the fixed-price shops meet your budget, you can skip the bargain-at-the-market part entirely. Make sure you can take it home. Not everything on sale in Bali can be safely taken back to the U.S. Pirated DVDs, weapons, animal hides, and alcoholic beverages may be seized, or may be subject to heavy fines, upon arriving stateside.